Mount St. Helens erupted one-quarter cubic mile of magma through a nozzle that day. After that, geologists coined a new word to describe colossal volcanic events--supervolcano.2 They were convinced that enormous chambers of magma could be erupted along fissures as well as through nozzles. Modern "nozzle eruptions" (such as Krakatoa in 1883 and Mount St. Helens in 1980) usually eject less than 3 cubic miles of ash. Such nozzle eruptions are trivial compared to the ancient fissure events that created supervolcanoes, in which more than 240 cubic miles of magma were erupted. These colossal volcanoes were over a thousand times larger than Mount St. Helens. For example, Ice Age supervolcanoes, such as Long Valley of California and Yellowstone in Wyoming, exploded just after the Flood. Unlike nozzle eruptions, these were "ring-fissure eruptions." A vertical crack opened to vent ash, then the crack unzipped in a vast circle and finally collapsed catastrophically to form a circular or an elliptical depression called a caldera. Crater Lake in Oregon is just a very small example of a caldera from a circular ring fissure. 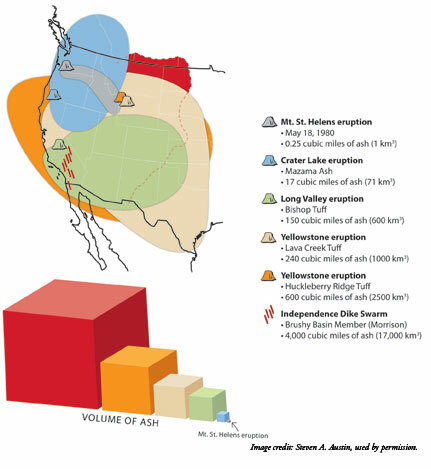 Yellowstone and Long Valley are some of earth's largest calderas. In northwestern Italy, a 16-mile-thick succession of rock was turned sideways by the late Flood catastrophic plate collision between Europe and Africa.3 The sideways succession of rock displays the understructure of an eight-mile-wide caldera, allowing us to visualize the plumbing system that sustained some of the earth’s most colossal volcanic explosions. Even bigger supervolcanoes erupted earlier during the Flood. These larger supervolcanoes occurred as "linear-fissure-arrays eruptions." These are parallel fractures that do not turn to form an ellipse or circle. For example, the Independence Dike Swarm in southern California was caused when catastrophic plate tectonics opened numerous parallel fissures a hundred miles long. The array of linear fissures extends southward from east-central California to Baja California.4 This colossal eruption deposited the Brushy Basin Member of the Morrison Formation ("Upper Jurassic") of the Rocky Mountain and Great Basin regions, which today contains more than 4,000 cubic miles of ash.5 Within the Brushy Basin ash are sandstone beds that represent the gigantic mudflows that swept up and buried dinosaurs. Not just volcanic ash, but colossal lava flows also issued from "linear fissure arrays" on both the continents and on the ocean floor. The Columbia River Basalts of eastern Washington and Oregon were erupted from parallel feeder dikes in southeastern Washington. Seafloor lava flows called the Nikolai Greenstone are up to seven miles thick and have been docked by tectonic process to form southern Alaska. The eruption of Mount St. Helens 30 years ago provides an opportunity to pause and reflect on the supervolcanoes of the past. We see the fury of Flood volcanic activity and the declining power of post-Flood volcanism.6 Mount St. Helens is almost trivial when compared to previous explosive events. Yet, the eruption of May 18, 1980, has opened a window to the turbulent volcanic world of the past, providing further confirmation of the Bible's depiction of a young earth that was catastrophically shaped by the global tectonics of the Flood. Morris, J. D. and S. A. Austin. 2003. Footprints in the Ash. Green Forest, AR: Master Books. The word "supervolcano" was coined by the BBC documentary Supervolcanoes, first shown February 3, 2000. Quick, J. E. et al. 2009. Magmatic plumbing of a large Permian caldera exposed to a depth of 25 km. Geology. 37 (7): 603-606. Austin, S. A. and W. A. Hoesch. 2006. Do Volcanoes Come in Super-Size? Acts & Facts. 35 (8). Hoesch, W. A. and S. A. Austin. 2004. Dinosaur National Monument: Jurassic Park or Jurassic Jumble? Acts & Facts. 33 (4). Austin, S. A. 1998. The Declining Power of Post-Flood Volcanoes. Acts & Facts. 27 (8). * Dr. Austin is Senior Research Scientist and Chair of the Geology Department. Cite this article: Austin, S. 2010. Supervolcanoes and the Mount St. Helens Eruption. Acts & Facts. 39 (5): 4-5.